Water that hasn't seen the light of day, or had contact with the Earth's atmosphere, for 2.5 billion years has been discovered in Ontario, Canada. Reporting in Nature this week, a team of Canadian and UK-based scientists analysed water collected 2.7 kilometres underground from a copper and zinc mine near the city of Timmins. The water is trapped in a system of extensive volcanic deposits laid down over millions of years and dating back billions of years. By studying the proportions in the water of a range of noble gas isotopes, which are heavier and lighter forms of the same chemical element, Manchester University geochemist Chris Ballentine and his colleagues have been able to show that the water has a chemical fingerprint consistent with having been sealed off underground, without contact with the outside world, for at least 1.5 - and possibly as long as 2.5 - billion years. The findings are also doubly interesting because the water, which was collected carefully to avoid contamination with atmospheric air - is also crammed with dissolved methane and hydrogen. These chemicals, which are produced when natural radioactivity in the rock splits apart water molecules, are capable of sustaining life. This finding - of extensive, isolated and ancient subterranean water courses, raises the tantalising possibility that unique ecosystems may have evolved to exploit these sorts of environments. And although the team haven't yet reported whether there's anything living in their Canadian water, microbial communities have previously been found thriving in hydrogen-rich pockets of water cut off from the outside world for 40 million years in gold mines in South Africa. If evidence for living organisms dating from the dawn of life on Earth does turn up, it significant raises the stakes for finding life on other planets with similar geologies and extensive sub-surface water, like Mars. The Royal Society for the Protection of Birds (RSPB) wants the marine practice of discharging a chemical called polyisobutene (PIB) banned after 4,000 birds were injured or killed by the substance. Injured seabirds covered in this gluey substance were washed up on beaches in the south of England in mid-April and it took almost three weeks to identify the offending chemical. It now turns out that the substance that has injured so many seabirds is a ubiquitous ingredient in chewing gum, cling film, glue and, crucially is used in ships' engines as a thickener and lubricant. It can legally be discharged at sea in limited quantities. But it's stickiness and hydrophobicity (it repels water) means that is clumps together in gluey amalgamations that can clog the feathers of unfortunate seabirds. According to the RSPB, "We are urging the government to call on the IMO to urgently review [its] hazard classification and implement regulations and a systematic monitoring programme that prevent any further tragic and wholly avoidable incidents like the one just witnessed." The call is also being supported by the industry body, the UK Chamber of Shipping. 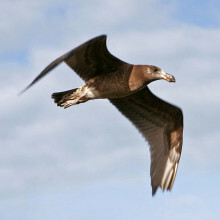 Alec Taylor, marine policy officer for the RSPB, said that, with this support, he was hopeful that the UK government could "push for tighter regulations preventing the discharge of PIB into the sea for good". 07:32 - Did selfishness fuel farming? Debate has raged for many years over why this change occured when it did. Was it that a new technology became available which made farming possible? Was it that farming was a more efficient way of life? Or was it that changes to the Earth's climate made farming possible? A paper published by Samuel Bowles in PNAS this week argues that none of the above quite fit the evidence. His team, based at the Santa Fe Institute in California, point to archaeological discoveries that the early farmers were more under-nourished than the hunter gatherers who lived around them as evidence that farming was not a more efficient way to find food. Moreover, even if farming makes more efficient use of land than hunting and gathering, the world's population was in decline at the time and there was no particular need to be efficient in land use. Any suggestion that new technology helped the advent of farming also doesn't stand up to scrutiny. The basic tools of farming are seeds and ploughs, both of which are much simpler than the spears needed to hunt down a woolly mammoth in the wild. 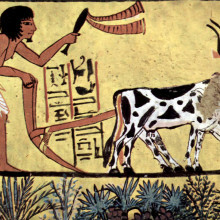 Samuel Bowles suggests that the key to the beginning of farming may have been that we evolved to be more possessive and forceful in defending our exclusive right to property. He goes on to argue that since it is easier to raise children when settled in one place rather than roaming the countryside, once a few possessive individuals had set up farms which they defended against trespassers, they would have grown in number to take over control of society within a few generations. Researchers in Canada have discovered that the pigmentation in butterfly wings indicates how far they migrate. 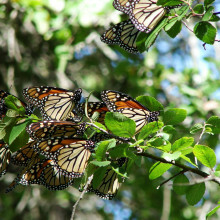 The team, led by Daniel Hanley at the university of Guelph, studied monarch butterflies, which migrate from Canada to Mexico. They found that monarchs picked up in the northern US had less melanin - a dark reddish pigmentation- than those found in the Gulf of Mexico. The researchers think the butterflies might use the pigment to absorb more thermal energy from the sun in order to fuel their journeys, enabling them to fly further and faster. 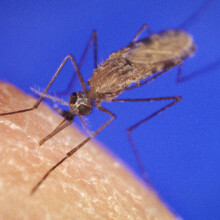 Malaria manipulates infected mosquitoes, making them more attracted to human skin odours, new research has revealed. Writing in PLoS One, London School of Hygiene and Tropical Medicine scientist James Logan and his colleagues presented groups of Anopheles mosquitoes, which transmit malaria, with nylon membranes mimicking human skin. Half the membranes were also impregnated with human skin odourants, the other half were left clean. Predictably, the mosquitoes were drawn significantly more frequently to the odour-impregnated membranes. That much was known and expected. But when mosquitoes infected with the falciparum strain of malaria were tested in the same way, the rate at which they landed on and probed the human-odour-laced membranes was over four-fold higher than the control, uninfected insects. This shows that the parasite is, in some way, manipulating the behaviour of the insect to intensify its attraction to human odourants. The team speculate that the effect is likely to be mediated at the level of the insect's olfactory (smell) system, perhaps through increasing the levels of receptor molecules that pick up human scents on the mosquito antennae. Understanding how this is achieved, they argue, might lead to important new avenues of research that can help to reduce the global burden of falciparum malaria, which causes hundreds of millions of infections each year and kills over three quarters of a million people. Angelina Jolie has revealed that she carries a gene which predisposes her to breast cancer. Here's the Quickfire Science on the BRCA1 gene. Pete - Angelina Jolie carries a mutation in the BRCA1 gene, which stands for breast cancer susceptibility gene one. 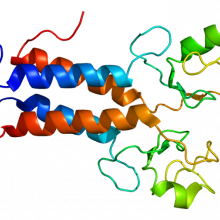 Elena - BRCA1 is among a class of genes known as tumour suppressors, along with another gene which predisposes to breast cancer, called BRCA2. Pete - These tumour suppressor genes encode proteins which are involved in the control of cell division, as well as in the repair of damaged DNA. Elena - When changes, or mutations, happen in these genes, the resulting proteins may lose their protective function, and so DNA damage can accumulate and cell division may become uncontrolled. This can lead to the development of cancer. Pete - Mutations in BRCA1 and BRCA2 are passed down through generations, and when a parent carries a faulty version, each of their children has a 50:50 chance of inheriting it. Elena - Not all people with the faulty BRCA1 or BRCA2 genes will go on to develop cancer, but women with it are around 5 times more likely to develop breast cancer than those without. They're also at a higher risk of other forms of the disease, including in the ovaries. Pete - Men with harmful mutations in these genes are also more likely to develop breast, prostate, and pancreatic cancer. Elena - People with a family history of breast cancer can be genetically tested to find out if they carry the BRCA1 or BRCA2 mutations. This involves a blood test, which looks for the defective changes. Pete - There are a number of options for those who carry the mutations. Angelina Jolie opted for a double mastectomy, where most of the tissue is removed from both breasts, reducing her risk of cancer here to 5%. Elena - Alternative treatments include using tamoxifen, a drug which blocks oestrogen receptors in cells. This female hormone encourages the growth of breast cancer cells, so blocking it reduces the chances of getting the disease. Dr Graham Davis - Queen Mary, University of London - So I'm not sure of the exact age of this scroll - it is actually a rolled up parchment so it didn't start life as a scroll but once it's rolled up as far as we're concerned it is a scroll, as far as the machine is concerned and all the technology we need to unravel it. I'm Graham Davis, Reader in 3D X-ray imaging, Institute of Dentistry at Queen Mary, University of London. I'm actually standing here at our third generation of scanner that we have developed here and this whole system here, this is obviously a lead lined enclosure, so once this door is closed there is going to be no x-ray leakage anywhere it is completely safe to sit here. James Harrison - Nowadays X-ray technology used to look beyond what we can normally see with the naked eye is a familiar procedure in medical diagnosis. Modern X-ray machines are now capable of creating three dimensional scans using X-ray computed tomography better known as CT scanning. Just as CT scanning has helped improve medical diagnosis, scientists are now proving its capability in the field of cultural heritage especially in helping to reveal the content of parchment documents which for hundreds of years have remained too delicate to unroll. Professor Tim Wess is from Cardiff University. Professor Tim Wess - Cardiff University - Parchment is skin, its dried skin that has been salted and limed and stretched and beaten and had hot water poured over it trying to make a smooth writing surface and so understanding how molecules behave over hundreds of years is something that interests me and parchment has been a fantastic vehicle to be able to study that. So working in that vein I then got more and more involved with samples where the documents had effectively turned from the collagen into gelatine and actually glued themselves together. Dr Graham Davis - Jim gave me a number of parchment samples and these weren't actually scrolls but we just rolled up a small piece put it in a container put it in the X-ray system and sure enough we could see the ink on it. Now we didn't have any means of unravelling it then but what we did have was some rendering software created at the Australia National University which would actually allow us to slice it and actually we could at least see writing that was on the inside of the scroll or on the outside of it. And it looked so good that when we sent it to Tim he thought this was some kind of mock up and we had to say to him that it was actually reconstructed from X-ray views of it and he was quite impressed then as were most people who had seen it so that's what really got the ball rolling. James Harrison - Once the first pioneering 3d scans were completed the school of computer science at Cardiff University used computer modelling to present a flattened view of the documents allowing a researcher to read what was on them, an exciting prospect for all concerned. Professor Tim Wess - The first time that I saw that done there is definitely, and it's one of those moments in your scientific career that sends shivers down your spine for the right reasons and you don't get that many of those in your career and seeing a flattened out document and we could all read it. And then handing that to the palaeographer who can then go an interpret that and say what the impact of that is in terms of history is a wonderful opportunity to have and it is great to be part of that chain. James Harrison - The moment clearly proved to be a significant turning point for historians and archivists and their ability to access historical information with literally thousands of historical documents locked away in archives the world over now available to the research community. Professor Tim Wess - The support that we got from archivists who said if this can be done then it would actually revolutionise the way in which archives and difficult to access documents at archives, you know history could be recovered from in a way that we don't actually know what some documents, the information on some documents we can have a guess at what they contain but if we can actually reveal that it once again resets the priorities of how we might store them. James Harrison - With funding from the Engineering and Physical Sciences Research Council this innovative use of X-rays and three dimensional micro tomography gives us an unparallel glimpse into our hidden past. And it's not just about simply detecting iron particles contained in medieval inks. 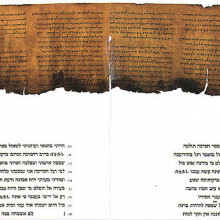 What makes the technique stand out from other methods is the unprecedented high contrast resolution it provides to clearly distinguish between ink and parchment, meaning text is much clearer and therefore readable? The discovery has also proved beneficial back in the departments that first developed the technology in relation to the human eye for example high contrast X-ray micro tomography has the potential to help ophthalmologists investigate problems related to glaucoma while for Graham Davis and his colleagues at Queen Mary's Institute of Dentistry this enhanced scanning technique is helping advance aspects of dental research. Dr Graham Davis - As well as developing the new scanner we have made a number of improvements to existing scanners using our technology that we have developed here and that's already, where we are using that in dental research, to see things in teeth that we hadn't seen before and in fact we have just got a paper that has just been accepted now talking about high contrast X-ray micro tomography in dental research. James Harrison - Back in the domain of cultural heritage there are aspects of the new technology that still need to be improved. While the archive community has been excited by the prospect of at last being able to read inaccessible documents there are still several developments required to make the machine practical. Dr Graham Davis - The detector that we are using at the moment the CCD detector isn't the most efficient one it's not the fastest but it gives us the most accurate results and that's why we have stuck with that. When we've got that, when we've shown feasibility that we can do this then we start to think can we make it faster, can we make it portable so that we can transport this thing to museums or archives, those are the sort of things that will come in future projects but at this level it was rarely while asking the question could this be done or can't it we are on that narrow line between possibility and impossibility and I hope we are on the right side of that line. Brian Golding takes us through how a weather forecast is put together, and how much we can trust it. 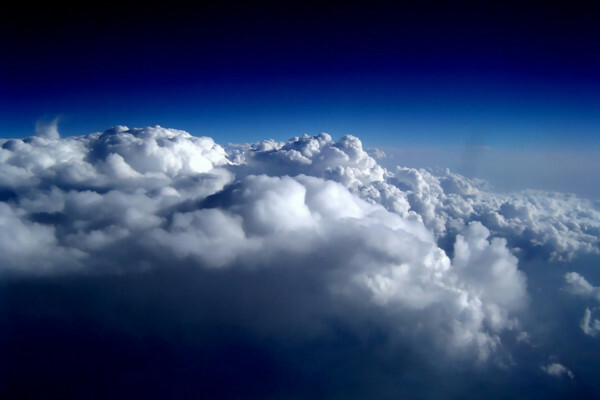 Alison Ming discusses how hot air from the tropics pushes its way up through the atmosphere. How does air move between atmospheric layers? Ben Valsler spoke to Alison Ming, a PhD Student at the Cambridge University to find out more. Alison - I'm working on the problem of tropical upwelling and what drives it. We know that air in the troposphere, so the lowest layer of the atmosphere we live in, air of the tropics rises up by convection because it's really warm there. And it carries on going, but at a certain point, it hits the tropopause and the tropopause is sort of that notional boundary between the troposphere (the layer below) and the stratosphere (the next layer above). So, when it hits the tropopause, it carries on going into the stratosphere. What causes that air to carry on going into the stratosphere is still a question that is being debated and that's what I'm working on. Ben - So, what is the structure of the atmosphere above us? Alison - The layer we live in is called a troposphere and the temperature really decreases upwards in the troposphere then the temperature sort of stabilises and increases in the stratosphere - so there's an inversion of temperature. And people use that to therefore define a tropopause which is that sort of notional boundary that sits between the troposphere and the stratosphere. And the tropopause is lower in the midlatitudes. So above us, it'll be about 10 kilometres high. In the tropics, it's much higher. It will be about 15 kilometres. Ben - So, you've mentioned the troposphere and the stratosphere, but what's the difference and where's the boundary? Alison - There are many ways in which you could separate the two layers of the atmosphere. So, they're not obviously separated. There isn't a fixed boundary between the two, but you could use different properties of them to define that tropopause. So, one way of defining it would be using the temperature, there are other dynamical quantities that you could pick a value of and say, "We'll take this value to be roughly where the tropopause sits." Ben - Why do you think there needs to be a different mechanism? Why can't it just be more convection? Alison - Some people think it is just more convection, but other people think that waves from just outside the tropics travel up to that region break and then tops up the air. So, that's a different pumping mechanism to air just rising because it's hot and there's various other mechanisms that people think might be driving that upwelling and I'm trying to figure out which one it is. Ben - So, why is it important to us? Why do we need to know what the process is that actually pushes this air into the stratosphere? Alison - Understanding the dynamics of a climate means that we then understand better how our models work. Also, it means that our weather models will also get better and understand what's going on in there. Ben - So, in terms of understanding our weather and understanding our climate, why is it important that we know what's going on up in the stratosphere? Alison - In the past, people didn't really think that the stratosphere mattered to what happens to us in the troposphere and weather modelling didn't include stratospheric levels. But then we found that there was a hole in the ozone layer, and discovered that if the ozone layer wasn't there then we'd all be bombarded with UV radiation. But then also, there is a very slow circulation in the stratosphere. So, air that goes up over the tropics then travels polewards very, very slowly. It takes up to 5 years to reach the poles and then it falls back down. And that circulation has an indirect effect on the troposphere and both the stratosphere and the troposphere are coupled together. And people found that by including the stratosphere into weather models which is something that's only been done very recently, we could improve our predictions of weather. Ben - So, even though we in the UK are a very long way from the tropics where this upwelling is actually happening, there is an important dynamic process going on, thousands of metres above us from thousands of miles away that can then impact, not just the weather that we have, but the long term weather trends the climate. Alison - Yes. Most of the stuff that gets into the stratosphere gets there through that tropical pipe. So, things like CFCs, aerosol, pollutants, everything gets up to there via that tropical pipe. Those CFCs and other aerosols will eventually affect the (radiative) balance in the stratosphere and then eventually affect the climate in the troposphere. So, one example I'd like to take is in 1991, there was a volcanic eruption - the Pinatubo eruption and that volcano managed to inject quite a lot of dust and aerosols into the stratosphere. The few years following Pinatubo, the whole world was slightly cooler, mostly because there were lots aerosols in the stratosphere. It's not effect that was felt right after the eruption, but was an effect that was also felt for many years after. Ben - So, it's obviously a very important thing for us to understand this global transport and the transport between different layers of the atmosphere. How are you actually going about it? What are you doing to study it? Alison - What I do is, I take a very simplistic model, two layers of the atmosphere and what that model does is, it models the very basic circulation around the planet and then I look for specific features in my model results to see whether I can understand what drives the upwelling in that model. And then I'd look at observation data set and see whether I can find similar features and if they do exist, then it's very likely that the dynamics that's happening in my model is similar to the dynamics happening in the real world. Ben - Once we know that, what sort of new questions will we be able to ask or hopefully answer? Alison - One of the other questions I'm working on is just above the tropical tropopause, there is an annual cycle in temperatures. If you think of it, the sun goes over the tropics twice a year, so there really should be a semi-annual cycle in temperatures, but as it happens, there's a very, very strong annual cycle and that's the one other question that's also of interest to me and I'm working on. So hopefully, by better understanding tropical upwelling then I'll be able to have a good stab at what is also causing that annual cycle. Despite the level of probability still involved in weather forecasting, sometimes there are weather events like severe flooding that we need to prepare for. To find out how we make sure that we see these events coming, Chris spoke to Nick Graham from the MET Office and started out by asking, just what can be called 'extreme weather'. Nick - Well, the MET Office define extreme weather as heavy rain, severe gales, heavy snow, ice and also fog. All of those things can cause an impact on the UK. Chris - How do you go about trying to predict them? Nick - We have forecast models that we run here from the MET Office. We also see information from other forecasting centres and the team of key forecasters bring all that information together, and if we see something that's developing a few days in advance then initially, we will take some action of beginning to inform people that there's a risk that there could be some extreme weather on the way. And then as we get near the time, say, sort of 1 or 2 days in advance, we tend to get stronger signals. That means then we can sort of up the tempo if you like and then we can begin to warn, we can begin to put things out to the media and it sort of builds up from there, and we have a National Severe Weather Warning Service which basically comes up with a colour, and that is a way of depicting severity of the weather we're expecting. Chris - How do you know though when you're looking at the information presented to you by a whole raft of measurements obviously? How do you pick out from that, the danger signals? Nick - Take wind for instance. To get very strong winds across the UK, you've got to have quite a major low pressure system coming across the Atlantic. These systems almost start from nothing that you begin to see the clouds are sort of thickening up in the western side of the Atlantic, and when you get a major low pressure developing and pushing across the UK, you can almost estimate the amount of wind you're going to get as it hits the UK, and then that's when you begin to sort of nail down your information that goes into the warning service. Chris - So, where are you getting your information from? 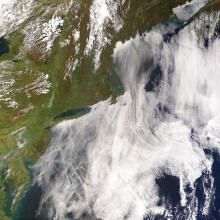 Obviously, you're saying cloud cover, so you must be looking at satellite images, but what else? Nick - Well, yeah, as I say satellite images is quite a key aspect these days. We're also getting radar, so when we're forecasting heavy rain, our radar network across the UK is very good indicator. Chris - Sorry to interrupt you, but is that because basically, radio waves get soaked up by water and so, you're looking at how much does or doesn't get bounced back? Nick - Well, it's a bouncing back of raindrops if you like, so when you send a pulse of radar up into the atmosphere then it bounces back off the raindrops so the sort of bigger the bounce, the greater the amount of rain that's there. So, that's one way of seeing it. And as I mentioned before that the forecast models from the computer these days are pretty accurate. I mean, over the years, we've seen big improvements in forecast and in fact, our 4-day forecast these days is as good as 1-day forecast whilst 30 years ago - and we see all these information and it's then sort of bringing all that together distilling it and say, "Okay, what does that mean for the public?" and that's when we distill it into a warning on the Met Office website. Chris - But obviously, you've got quite a lot of power there because in your hands, is warning people to deploy various resources and potentially spend a lot of money defending against something that hasn't even happened yet. So, you're in quite a stressful position, aren't you? Nick - Well, what we do is share the information, the sort of weather information to other teams. So, if we take rain for instance, ourselves and the environment agency work together. In fact, in the MET Office, we have what's called a Flood Forecast Centre and we've got environment agency people and MET Office people working together. Now, it's a little bit like putting a jigsaw altogether because the impact of rain could be different on certain occasions. If you take a certain amount of rain that's expected to fall, so that'll be the MET Office saying like, "We expect say, 50 millimetres of rain to fall in that area tomorrow." So, that's the first piece of the jigsaw. Now, if it's been very wet prior to that, then 50 millimetres of rain can cause huge impacts, I mean we saw through the course of last year, we had the rain events on and on and on, that we needed less rain to cause major issues. Chris - Because the ground is already saturated. Nick - That's right, yeah. Chris - Now, the predictions that we read from climate modellers is that if global warming and climate changes plays out to the way they are anticipating, we can expect to see more severe weather in the future. In fact, some people are saying, "Look, hurricanes are already intensifying if you look at what's been happening in America in the last few years." So, is the MET investing actively in more people doing your sorts of jobs and looking for patterns in order to meet this threat head-on? Nick - The simple answer is yes, because with the general temperature of the air across the globe heating up, it means it can hold a bit more moisture, I think we've certainly got to cater for the fact that the risk of extreme rainfall and the impact that occurs to be like flash flooding as we've seen maybe in the last few summers, we certainly got to cater for that as happening more regularly than we've seen in the past. And that's the kind of information that is being fed to local authorities. We got a set of scientists here working in place with the Hadley Centre and they're looking at possible scenarios in the future based on warming trend. People that are then forecasting on a day to day like myself and my team, we're also aware that those kind of challenges are going to be faced. And we may have to change our definitions of extreme based on what we're seeing. I mean, authorities may need to think about how future drainage systems, town layouts, concrete, etc., may need to take into account some of the changes that we're expecting over the next say, 50 years. What is the weather like on other planets? John Zarnecki explains. 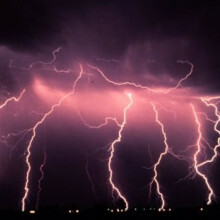 The weather on Earth may sometimes seem pretty extreme to us, but across the Solar System, even wilder weather phenomena are raging. 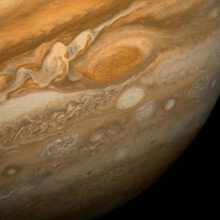 The famous red spot on Jupiter for example is a hurricane. It's larger than Earth and it's been blowing for hundreds of years. To find out what we can learn from the weather systems on other planets, Dominic spoke to Professor John Zarnecki from the Open University. He started by asking, where else in the Solar System we might find weather that we would recognise here on Earth. John - Well, of course we're talking about places that have atmospheres. So, we're generally talking about Mars, Venus, and actually, my favourite place which is Titan, the largest moon of Saturn, which also has an atmosphere. And we see some aspects which are quite familiar - We see clouds, we see winds, we see temperature variations between night and day, we see pressure systems. So, in some respects, we see things that are familiar, but actually, if you look a bit more closely, then things start looking a bit different. I mean, for example, the temperatures are much more extreme and then if you take Mars as an example, we have incredible dust storms, even sometimes dust storms covering the whole of Mars. So, it's really a mixture of the familiar and the rather unfamiliar. Dominic - So, is that just because these planets are at different distances from the sun and we see different amount of heating or does the chemistry of their atmospheres really affect the kind of places they are? John - It's a combination of quite a few factors really. Certainly, the distance from the sun has a big influence because as we know, it's the radiation, the energy from the sun that drives much of weather. So, we've got Venus, which is closer to the sun and then Titan at the other extreme which is about 10 times further from the sun than us. So, that's one factor that there are other things, the pressure of the atmosphere, the amount of atmosphere is very important. For example, Venus, very roughly has a surface pressure about 100 times greater than us here on Earth. Mars on the other hand is about a factor of 100 times less than our surface pressure. The composition of the atmosphere comes into play, but perhaps less so than those other factors. And again, going back to the dust on Mars, that plays a big part because dust, you might think it's a bit inconsequential, but they're very efficient at absorbing sunlight then that is reradiated into the atmosphere. So, this is a factor of various differences which collectively make up these differences that we see. Dominic - I guess the big surprise for me is that we're talking about Titan because we think of Venus and Mars as being quite Earth-like because they're relatively close to us in the Solar System and they're being quite well-studied. How does Titan manage to be similar to the Earth despite being 10 times more distant from the sun? John - Yes, it is fascinating and Titan is basically an icy moon. It's mostly, at least the surface and the shell is made of ice; and as you say, it's a lot further from us, a lot further from the sun than we are. And yet, strangely there are remarkable similarities and parallels, and that I think has surprised us. We weren't quite expecting that when we started studying Titan in great detail in the last 10 years or so. In particular, there is a material, liquid methane which plays the same sorts of role on Titan as water does here on Earth. It can exist as both a gas, a liquid, and a solid. And as a result, there is the equivalent of the water cycle on Titan. So methane sits in seas on the surface. 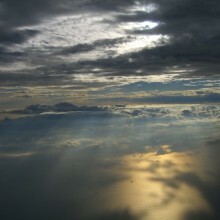 It evaporates into the atmosphere, it forms clouds and then it falls as rain onto the surface. So, in that respect, we see systems on Titan that seem remarkably familiar. It's just that the materials are different, but the physical principles are essentially the same. Dominic - Now obviously, we got very detailed measurements of the weather that we have on Earth. We've got weather stations. We've satellite images and radar. How does that compare with how much we know about the weather on other planets? John - Well, that of course is an excellent point. We have compared with Earth of quite sparse data. Having said that, Mars is now moderately well-studied. We've had quite a few space craft visited which have taken observations over long time spans and that is what you need of course to better understand weather. So, we're beginning to build up a picture of the variability, particularly of Mars and in fact for Mars, there are in existence, what we called Global Circulation models. So, these are computer models which try to explain and predict how weather will vary across the whole planet. So in that respect, Mars is similar to Earth in at least in our depth and range of our knowledge. For Venus and especially Titan, the data is much more sparse just I suppose because they're more difficult to observe. Venus of course is a terrible place to try and make measurements from the surface. It's horrifically hot and the surface pressure as I said is about 100 times more than on Earth, so it's terribly difficult to put down a lander and have it survive for more than a few minutes. But we're gradually building up these models and of course, why it's important apart from intrinsic scientific interest, it does allow us to look at weather and physical processes which occurring on the Earth, but we can observe them in a totally different environment, and that certainly helps us to make better models of weather here on our own Earth. Dominic - That's an interesting point of course because there are always people who will say, given the problem we've got on Earth, worries about climate change and so forth, is it worth investing in going to understand other planets when we could be worrying about our own planet. So, what you're saying is that, looking at weather elsewhere in the Solar System can help us understand where the Earth came from and where it's going. John - Absolutely so. Now, I wouldn't say that the entire business of space exploration is justified purely for that reason, but it is one of the bonuses that we get from it. And of course, the greenhouse effect for example, which as we know is very important for us here on Earth. It's not something that is unique to the Earth. It occurs on other planets certainly in an extreme case on Venus. We have an extreme greenhouse effect there which is partly responsible for the very high surface temperature and even on Titan - cold and distant Titan. There is also a small greenhouse effect in operation. So, these are the sort of things that we study, we hopefully understand better, and who knows, in the long term, this might be quite significant in the way we better understand climate change and maybe respond to it also. 52:55 - What is wind? Hannah - So, what is wind and why is it with us? For the answer, we turn to meteorologist and weather forecaster, Jim Bacon from Weather Quest at the University of East Anglia. Jim - The wind is what you feel when the molecules of air start moving. The question is, what makes them move? And this is the point where you can get a clue by listening to Queen's famous song, Under Pressure. Because it's the pressure difference that makes all of these happen. The atmosphere generally doesn't like things to be at a balance. It likes things all even. Just about any feature of the atmosphere would rather be in balance, well, if you go to a place where there's a lot of air above you, the air is denser, the pressure at the surface is higher. And where there's less air above you, the pressure is lower. This is an imbalance and it gives us areas of high and low pressure on the weather maps. And what the wind does is try to smooth things out by taking the air from where there's too much and moving it to where there's not so much. And the result of this is usually to reduce areas of high pressure and fill in areas of low pressure, if it quite achieves it. But the bigger the pressure difference that you start off with between high and low pressure, the quicker the wind wants to flow between them and therefore, you have a stronger wind. Well, it starts off as you might reasonably think, blowing straight from high to low pressure. But because the earth is spinning, other forces come into play, it gets a bit complicated, and in fact, it almost ends up flowing around the highs and the lows, but slightly towards the low. So, it's always trying to fill in the lows. And you could see how fast the wind might be flowing by looking at a weather map because on there, you'll find lines of equal pressure - isobars - and when they're close together, this means there's a bigger pressure difference between the highs and the lows, and therefore, the winds are stronger. 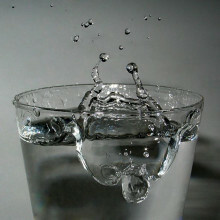 In other words, the molecules that make up the air are under pressure to move from areas of high to low pressure. Hannah - Thanks, Jim. So, it's the Earth's rotations and heat from sunlight that causes air density and pressure differences across the globe and this results in wind.